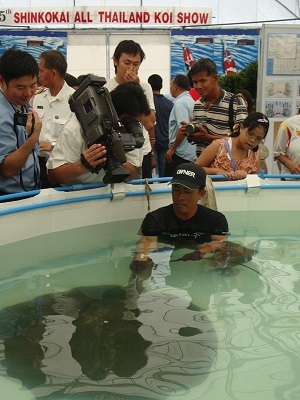 On request from the Department of Fisheries head researcher Dr.A.Sermwatanakal the Fishsiam team was commissioned to capture several wild Giant freshwater stingrays for display in a temporary aquatic exhibition to be held in Rangsit Future Park shopping plaza. A visit to the Maeklong River saw Boy fishing in the area 51 section of the river with large livebaits anchored at different ranges across the river. Soon after dropping the last of the baits a fast and determined take saw line being ripped from the spool at an alarming rate as a Giant freshwater stingray moved away with the bait. Quickly engaging the gear on the Okuma 2 speed multiplier saw the 80lb class rod dragged towards the surface of the river. Continued pressure was applied to the fish bending the rod to its full parabolic curve as the boatmen carefully manoeuvred the boat above the unseen predator. Several tense minutes followed which saw the fish move off of the bottom before once again embedding itself in the muddy riverbed. Piling on yet more pressure saw the fish wrenched from the muddy substrate where it was fought out with relative ease in the middle layers. With the fish only inches below the surface the anglers carefully unfurled a net beneath the freshwater stingray before securing it alongside the boat. The Giant freshwater stingray was estimated to weigh in the region of 60kg’s and was identified as a male. The fish was carefully transported to the riverside where it was placed in a holding tank at the rivers edge. Returning to the river the anglers quickly went about the task of re positioning the rods before sitting back in anticipation of another take. Almost two hours later the Okuma reel signalled yet another run as the clutch began ticking rapidly. Engaging the clutch on the reel resulted in the rod being almost wrenched from the anglers hand as a powerful Giant freshwater stingray moved across the riverbed at high speed! The fish on this occasion was clearly a much larger specimen which embarked on a series of powerful runs out in the main flow of the river. Several occasions saw the anglers having to follow the fish upstream as it literally towed the boat upriver! After fighting the fish for almost thirty minutes the Giant freshwater stingray was finally brought up from the riverbed where it was fought out in the middle layers. The Giant freshwater stingray was netted on the first attempt before being secured alongside the boat for the short journey back to the riverside. The stingray was estimated to weigh in the region of 100-120kg’s and identified as being a female. On arrival at the riverside the fish was quickly placed in a holding tank for a short recovery period before being transported to the aquatic exhibition in an aerated transporter. Fish exhibition for the Princess. The ‘Pla Mong Noum Khlao’ exhibition was organized by the Department of Fisheries with the assistance of the Chulalongkorn University research team. The exhibition included various Monster fish species which are native to Thailand’s freshwater river systems which had been donated by various aquariums in Thailand. Giant Siamese Carp, Mekong Catfish, Featherback and Sheathfish species were all displayed in various tanks and pools at various parts of the exhibition centre. Pla Mong Noum Khlao translated into English means ‘Fish exhibition for the Princess’ and attracted over 300,000 visitors, raising 3 million baht for a cancer foundation sponsored by HRH Princess Ubolratana. The exhibition was graciously opened by HRH Princess Ubolratana and was attended by a wide array of official delegates from various governmental agencies and the private sector. The exhibition recieved widespread media coverage and appeared on National news programs on Channel’s 9 and 10. The exhibition was a great success with large numbers of the public in attendance throughout its four day duration. With a great emphasis on learning and education being placed on the exhibition concerning freshwater fishes hundreds of local and foreign visitors were treated to lectures and displays of the various freshwater fish on display. The Giant freshwater stingrays were returned to the Maeklong River at the end of the four day show where they were released back into the tidal river.